How can I create my own Set? What saved bonus combinations are better to use? What are Sets actually needed for? In case you're still fretting over these questions, we will reveal all to you now. You can save a combination of Hero's Skills and equipment in a Set. Use this functionality wisely: create Sets with the combinations you need to quickly switch between them. It is useful to create several Sets that increase the Hero's stats for various situations: defending your Town, attacking Invaders, Onslaughts, etc. If enemy troops are marching towards you, switch to your military Set. If you have decided to send your warriors to a resource location, activate the economic Set. Enter the Hero's Abode, then the Hero Sets tab, and open the slot for saving a Set. To do so, you need Memory Points. You can purchase these for Gold in the Item Store or as part of Bank offers. You can also receive Memory Points as a reward for passing checkpoints in the Kingdoms Battle global Competition. There is a total of ten slots available for saving Sets. Having unlocked a slot, go to the Hero's Skills tab and distribute the Skill points. You receive these when you increase your Hero's level. In the Hero tab, put on the equipment that improves the stats that are important for you. Then save the current selection of Hero's equipment and Skills. To do so, select an available slot in the Hero Sets tab and hit the "Save Set" button. Enter the Set name in the window that appears. To activate a Set, you will need the Hero Set Activation item. You can purchase it in the Item Store or as part of Bank offers. It also drops as a reward for passing checkpoints in the Kingdoms Battle global Competition. To apply a Set, hit the "Activate" button. The Hero's Skills and equipment, as well as the stats thereof, are displayed in the Sets window. There is also a Bonuses icon, which you can hit to view the current bonuses and Set bonuses. Comparing the stats will help you judge which Set will be most useful for you. To free up a slot for a new Set, hit the "Delete" button. Please note: you can only delete a saved configuration of equipment and Hero's Skills while the equipment and upgraded Skills themselves remain at your disposal. The "Replace" button allows you to make changes to a Hero Set, for example, if you need to change one piece of equipment for another with higher stats, or add recently upgraded Skills to the Set. The icons in the Sets window are special markers that warn you when the equipment saved in a Set has been changed or is not in the Inventory. If a piece of equipment has been changed somehow, for example, inlaid with new gems, then this slot and piece of equipment will be marked with a yellow border with an exclamation mark. If a piece of equipment has been deleted, then, along with its slot, it will be marked with a red border with an exclamation mark. If you're just embarking on your military career, then you can collect packages of standard equipment. There are a lot of options, but there are two Sets that are most popular: for Knowledge and for building. Usually, the first includes the Falcon Figurine that speeds up the Knowledge learning process, and the second contains the Victor's Bracelet that increases building speed. Select Sets of special equipment depending on your main troop type. If you're improving your cavalry's stats, then create a Harald's Set, if you are focusing on your scouts, go for a Sigurd's Set, etc. You can view all of the bonuses of special equipment in the Forge, but to access the crafting of special equipment, special Drafts must be learned in the Arms Guild that is located in the Clan Stronghold. Don't be lazy when it comes to distributing your Skill points and creating Hero's Sets. Save at least two Sets: economic and military. Then you will be able to adapt to a situation quickly and will always be useful to your Clan. For example, let's say you're living a peaceful life and you only have an economic Set. Then you suddenly notice that someone wants to plunder and burn your Town. In the end, all you can do is believe in the power of your warriors and hope for some good luck. If you have a military Set in reserve, however, you will be able not only to defend your Town in a dangerous situation but also to help your clansmen in an Onslaught if needed. 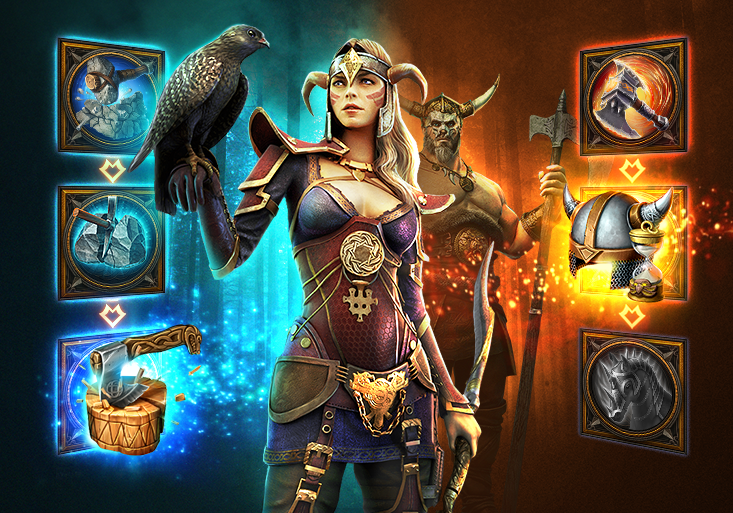 All experienced Jarls understand well the strategic power of Hero Sets. Now you know how to use them too. Change your tactics, try various combinations, and be victorious!